It's been a long time since Easter. The spring decorations have been tossed back in their boxes, and we're running around planning vacations and hosting barbecues. And in the midst of all this lovely weather, in the midst of the jobs and plans and vacations - we tend to forget the most important things. So our new series here at Bloom! is going to spend the next few weeks focusing on grace. What is it? How should we see it in our lives, our relationships with others? What does it look like to live a life of grace? Why do we so often forget it? We'll start with what it is - because that should change the entire way we look at the world. And you can't remind yourself of the truth too often. You've probably heard this saying: Justice is getting what you deserve. Mercy is not getting what you deserve. And grace is getting what you don't deserve. We can't understand grace until we focus our eyes again on the cross. A rough, bloodstained cross, signifying the most horrible death. And a life gladly given in love. The most unfair and unjust trade: Jesus' perfect life for ours. He took our sin, our failures, everything we've ever done or said or thought that was wrong - and everything right that we didn't do. He paid for everything that required punishment - so that we can stand before the Judge and hear the sweet words, "Not guilty." And there is more: because of that sacrifice, that utterly unearned gift, God sees us as whole and perfect. We are dressed in righteousness. And God calls us co-heirs with Christ. We will share in the kingdom. Did I remind you that we were enemies? We didn't simply ignore God when he chose to die, to save us (the ungrateful people who wanted to kill him, not be rescued). And we, who deserve eternal punishment....are instead promised an eternal happily-ever-after. We are called clean and righteous. We are given the kingdom. We can never earn it. Ever. And we can never lose it. Ever. So true...we would be nothing without God's grace...it makes me very thankful when I think about what God's done for me. I sometimes think, I'm not such a bad person, but we really are. But with the Holy Spirit and Christ's sacrifice we are made new and children of God. How amazing! 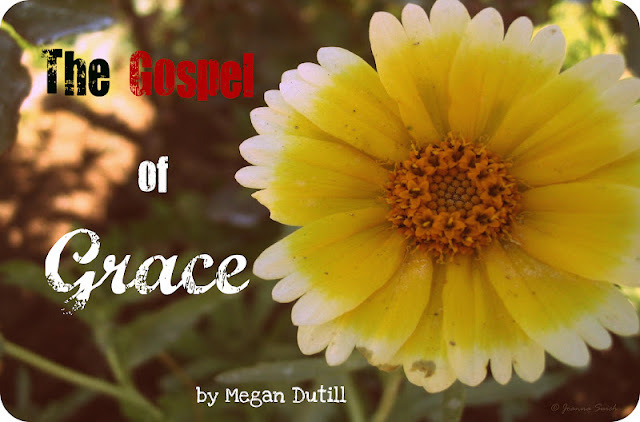 Grace makes all the difference in the world. It is such a beautiful and profound thing.